New shape for amazing performance, the new U-Surf will be a really explosive board in all conditions with a really fast rocker line that helps you get instant planing while the surf shape rails will give all the looseness needed for such program. The philosophy of the board is to provide maximum speed in all-round wave conditions, together with a reduced rail shape making the board turn on a dime for radical wave manoeuvres, and making these benefits accessible to all wave sailors. The generations of X-wave are built in exclusive high technology incorporating extensive use of Carbon & wood technology. 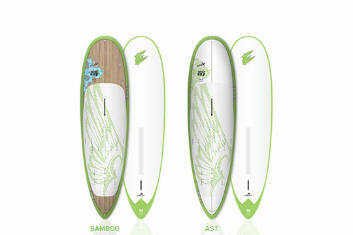 All boards come with CNC fins especially developed for fast wave boards. 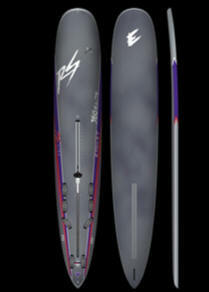 With a straighter leading edge these fins provide top control in high speed turns. New this year 2 new sizes with the X-wave 101 and 111 liter for sailors looking at sailing in any type of condition from big waves to onshore or bump and jump conditions. The X-wave will get any sailor of any weight instantly on a plane. The Silver line is built out the best construction with PVC and bi-axial glass full wrap. This technology brings new perspective for centers and sailors looking for the ultimate durable board at a fair budget, with a proven shape the Cross Silver will please all sailors looking for high end performances. 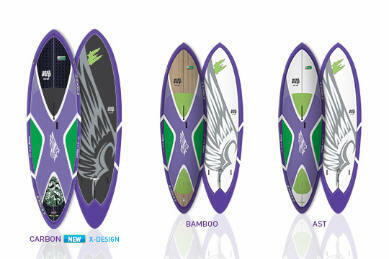 The new carbon versions of the Cross boards brings the range to a new level. This hi tech construction combined with a new CNC fin design brings the board to a new level of performance and comfort, ensuring that this proven shape is the perfect tool, even for the most demanding sailors. XCROSS 100 pro model will set up a new trend in the freeride world, not only it is a fast board but it turns amazingly, rails are extremely thin for a board of that width making it a perfect platform for all weather and wind condition. The fairly deep VE under the mast base will make you forget how thin the board is but then in manoeuvre the beast will reveal itself....an outstanding board for sure! 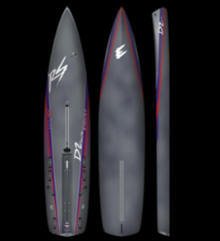 High end carbon construction and a new CNC fin boosts the horse power on the Scross Carbon line for 2013. While remaining extremely easy to control the Scross Carbon will reach it's top speed very quickly due to it's light weight and also helped by the new recess detail around the fin helping to minimize drag at all speeds. The Scross Carbon remains comfortable while providing excellent performance. The Silver line is built out the best construction with PVC and bi-axial glass full wrap. This technology brings new perspective for centers and sailors looking for the ultimate durable board at a fair budget, with a proven shape the SCross Silver will please all sailors looking for high end performances. 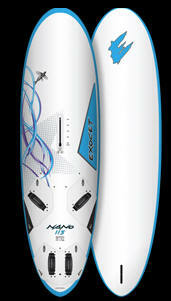 The NANO line is based on our previous best board shapes, built in the AST technology. 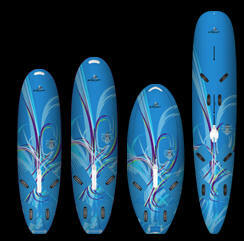 The NANO boards offer performance, accessibilities for a dime for any sailors or center. Thin rails for ultimate maneuverability. Doom deck shape for planning efficiency. ASA construction : Max durability at minimum cost. LINK line is top choice of centers in France, with the introduction of the new LINK S with no dagger the board range is now complete and will please most sailors that want to learn on a perfect platform. 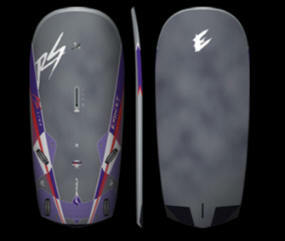 The new RS 2; 3 & 4 have a new shape featuring a straighter outline between the front and back footstraps and a narrower tail to improve top speed. RS 6 has got some major improvement with a reworked rocker line and VE and release the board and give it better acceleration and top speed. On the whole board range we have also increased the amount of vee beneath the mast foot to provide maximum release in gusty winds. The increased vee also offers good upwind abilities in all conditions. With it's carbon construction, the RS combines strength & stiffness with super light weight, helping to ensure that this board is truly a racing beast that will bring you to maximum velocity in an instant. Carbon Construction: light and stiff for earlier planning and acceleration. Unfinished paint: no extra weight. amazing speed on reaching legs. boards with an especially designed deck plan. 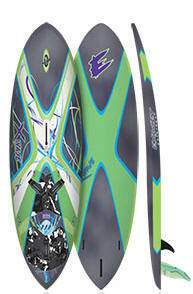 Enjoy a new way of windsurfing. while still giving you the choice of windsurfing mode. 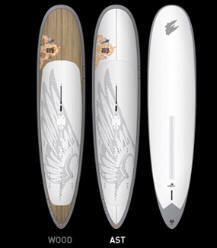 The dagger option will give plenty of options in any wind conditions. We have added several inserts on the nose deck in order to attach a net for gear or life jacket storage. 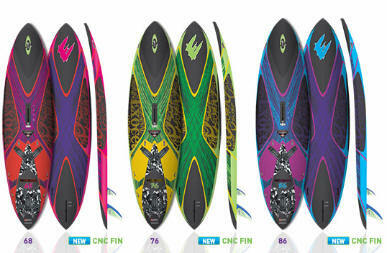 NEW In addition to the U-Surf 3 Tri Fin line, we have been developing some intermediate boards, including the U-Surf CORE models, offered in 70, 80 or 90 liters sizes, pintail shape, which will suit side shore conditions. 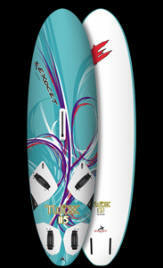 These will have different graphics to the U-Surf 3 line, however they will also be equipped with Tri fins and offered in a high end construction. in wave conditions as well as bump-and-jump freeride style sailing. slightly forward to optimize speed and gybing performance. and is extremely light for a board in this class. The Curve line has evolved from our established longboard line, and for 2012 we have simplified the line up with common graphic styling, and offered in Bamboo deck construction adding visually to the surf orientated concept of this line, along with all boards being equipped with Tri fin. with the addition of STD versions across the line. The LINK STD comes with a simplified EVA deck and does not have the wheel. the plane and gybes with ease thanks to the soft, rounded off rails. The SL SPORT line will give you access to top performance at a reasonable budget. Based on the proven shapes and designs of the former Warp SL, the SL Sport is the ideal board for fast free ride as well as high speed blazing in total control. The tucked under rails and built in shock absorbers makes the board extremely forgiving and comfortable in all conditions. Explore and enjoy the instant taste of high performance, on a board that can truly be referred to as a FREERACE board. will very soon become THE raceboard to own. NOTE: this board does not come with a fin. The RS ELITE has become one of the reference among the raceboard class, amazing glide upwind the new ELITE is also a top performing board in windy conditions. �Carbon Construction: light and stiff for earlier planning and acceleration. �Carbon look and unfinised paint: no extra weight. We also are proud to present the new RS D2 ELITE. This is one of the most interesting and appealing board brought on the market for many years, extreme performance in light wind the board match amazing speed on reaching legs. 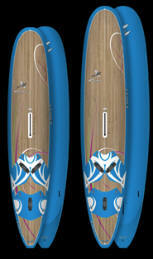 Enjoy your 200 litres of volume but still feel the exhilarating ride of a short board. The step tail design is not just another fashion gadget, but a technical feature adding obvious advantages due the extended water line in displacement mode, as well as the reduced wet surface as soon as on the plane. The natural standing position is in the centre of the board,and due to the step tail it remains the same even when you catch a wave and accelerate. A unique quality making it way easier to learn paddling in the waves.